What would happen if you sat down to dinner with the likes of Alicia Keyes, Jonathan Safran Foer, Drew Barrymore, David Lynch, Morgan Freeman, Sir Ben Kingsley, Alton Brown, Neil Gaiman, Deepak Chopra and David Foster Wallace? Fascinating conversation, without doubt. And one of the things all these folks have in common is that they practice gratitude and have a lot to say about it. All these thinkers and luminaries are in The Grateful Table making this a thoroughly modern book of blessings, both heartfelt and deeply profound. Saying grace is one of our loveliest traditions and one that has stood the test of time for a good reason - it simply feels wonderful. Whether you hold hands and pray to the heavens above or wax poetic about the bounty of food, these blessings turn any group of people into a family, connected by the power of gratitude. 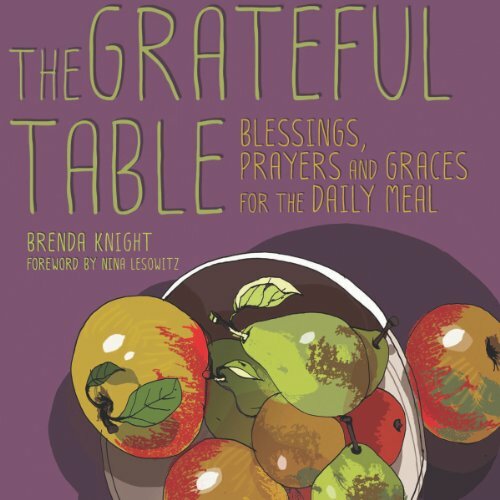 Compiled by the editor of and collaborator on the runaway best seller Attitudes of Gratitude, Brenda Knight has employed the practice of gratitude for years.